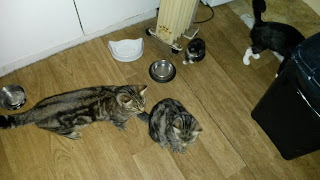 After yesterdays doom and gloom I thought I would post the latest picture of the moggies. The only guaranteed time to capture all four together is at meal times. The widget (Mindy) loves the old kitchen radiator and she is often found cuddled up to it. Believe it or not she has actually grown in size but she is still tiny compared to the others. Maisie has settled in well and even when the back door has been open she has made no attempt to leave, often running further into the house. It does make me wonder what happened to her before we acquired her. She prefers to remain indoors and we are happy to maintain that status quo. Happy cats equal a happy home.